Liverpool agency SB has been appointed as the Everyman & Playhouse’s creative partner after a three-way competitive pitch. The agency will look after the brand for the theatre's new resident acting company, its first for 25 years. Previous acting companies at the theatre have included the so-called ‘class of 74’, which launched the careers of actors including Julie Walters, Pete Postlethwaite and Bill Nighy. SB will also run a major audit of the venue's brand, including its food and drink offer, and look after its design work. The win comes after SB scooped a major win at last month’s Brand Impact Awards in London. 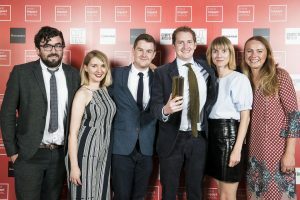 The only Northern agency to win, SB took the Culture Campaign award for its work for RIBA’s The Brutalist Playground exhibition. “We measure our success on the impact our projects make so it’s fantastic to have that recognized at the Brand Impact Awards,”said SB's head of brand, Lucie Davies. SB, which also has a London office, has also won new projects for Open Eye Gallery, international parenting blog Babyccino, Little Baby Company and Leaf’s new venue on Portland Street in Manchester. SB is also developing a new theatre campaign for Chester’s £37m new arts venue Storyhouse. It's also appointed Stephen West as head of digital and Emma Sundvall as project manager.